The wild strawberry, Fragaria virginiana, is an herbaceous perennial plant native to North America. It is one of two species of strawberry that were hybridized to create the modern domesticated garden strawberry. Leaf: A plant is typically consists of several trifoliate leaves at the tips of long hairy petioles. The leaves are green on top and pale green underneath. Each leaflet is about 3 inches long and 1.5 inches wide. The leaflets are oval shaped and have coarse teeth along the edge except near the bottom. 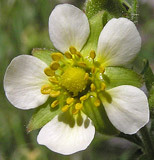 Flower | Seeds: The wild strawberry flowers in April, May and June. The flowers are white with many yellow stamens and pistils. There are ten small green sepals under the petals. Each pistil in the flower develops into a dark colored fruit, or a commonly perceived “seed” on the strawberries. The wild strawberry fruits are much smaller than the garden strawberry with which people are familiar. The fruit that people normally eat is not a botanical fruit, but rather an enlarged receptacle, the part that holds the ovaries, which develop into the black small fruits on the strawberry. Runner: Runners are stems that grow at the soil surface or just below ground that form new roots and new plants from the buds. The wild strawberry produces long hairy runners up to 2 inches long, which re-root to form plantlets. Theses runners are often dull red colored. Producing runners is the main way that the wild strawberry reproduces since seed germination is poor. Life span: The wild strawberry has a perennial root system. After it produces fruits in hot summer months it becomes dormant, and new leaves and flowers will grow the next year. The habitats of wild strawberry include moist black soil prairies, openings and edges of woodlands, savannas, limestone glades, and areas along railroads. When it is in open prairies it is usually not very far from woodlands. The wild strawberry commonly lives under full or partial sun. It is able to tolerate shade since it develops early in the spring. It prefers rich soil and moist conditions. It is able to grow in disturbed areas. The wild strawberry is a producer. It uses photosynthesis to convert the sun’s energy into glucose. It also converts carbon dioxide to oxygen, which is important for all organisms. Also, many types of wildlife eats it’s central portion of the flower, which is known as the receptacle. 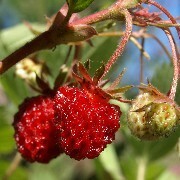 Non-human: Many types of wildlife depend on the wild strawberry as a food source. Humans: Humans can use the plants leaves for medicinal purposes, or eat its receptacle, which is a food source. Pests: Black vine weevil is a pest that eats its leaves. Tea from the wild strawberry’s dried leaves is used to treat dysentery. Even though we call them “berries,” the strawberry that we eat has an intriguing structure that is not a true botanical berry. In the center of the flower is a rounded core of ovaries, that when pollinated by bees, develop into many tiny fruits called achenes. To the human eye, these achenes look like that tiny yellow seeds or specks on the strawberry fruit. The red color and flesh of the fruit is the result of the tissues that held the ovary swelling and ripening and fusing to the ovary next to it, eventually creating a succulent, juicy mass we are familiar with. The wild strawberry is not the plant used to produce the strawberries found in super markets. The wild strawberry thrives along sandy soils near lakes and oceans. Did you know that the wild strawberry’s fruit is actually the seed-like structures located in the red berry part of the plant.